The Lyceum Theatre in Edinburgh is renowned for its award-winning sets. 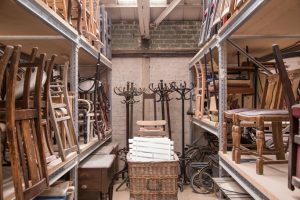 Thom Dibdin takes a tour around its Roseburn scenery workshop, where designers’ visions are transformed into practical solutions. 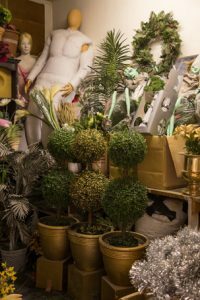 Out in east Edinburgh, on the back route down to Murrayfield Stadium – and a 10-minute drive from the Lyceum Theatre on Lothian Road – sits an unprepossessing mid-20th-century building next to a Screwfix outlet. 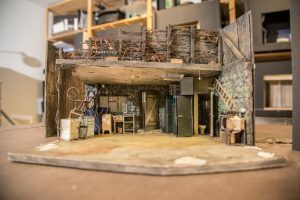 Its proximity to the hardware chain is fortuitous in a way, as this is the home of the Lyceum’s Roseburn scenery workshops, where its award-winning sets are built. 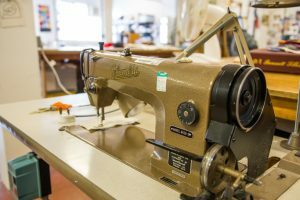 Inside, there is the bustle of a small factory, with the constant blare of a radio rising over the occasional buzz of a circular saw, or the clattering of a truck being put together. The smell is of wood, but not paint – although painting is a major part of what goes on here. 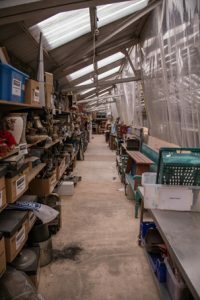 The main part of the workshop is a cavernous hall, built as a gymnasium. One end is taken over by parts of various sets either at the end of their lives, but still containing reusable flats, or just resting on the promise of a further life and a possible tour. 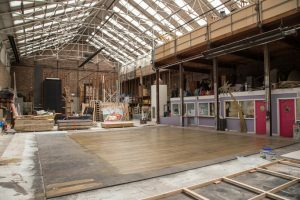 An oversized skip is used as an extra storage place for the current build – the complicated all-white box for the Lyceum’s Edinburgh International Festival collaboration on Rhinoceros – while at the other end of the hall, the various trucks and elements of the set are being put together. Looking down from the end wall is a giant scene painting dock, 9 metres high by 11.5 metres wide and capable of taking a whole cloth. At least it could in the days before health and safety rules banned work below the gantry. It has fallen out of favour in recent years at any rate, as the cost of printing a cloth has become close to the cost of painting it. 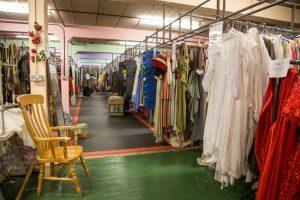 Then up some winding stairs, past the spray-painting corner, showers and green room, is the Aladdin’s cave of the prop store. Rose bushes, doors, chairs, walking sticks of more and lesser knobbly varieties and boxes, boxes, boxes. 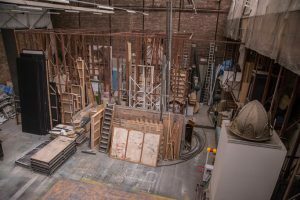 Everything from productions past that might come in handy again. Or because the design team just didn’t want to see it go. Built on to the edge of the hall, behind sliding doors, are the tool shops, the fabrication part of the enterprise. 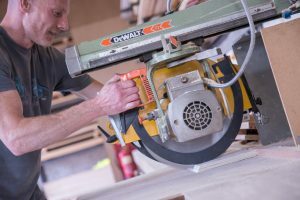 Dailly, who trained as a painter at Gray’s School of Art in Aberdeen, has been at Roseburn for more than 13 years and is at the head of a five-strong team, with two carpenters and two painters under him. 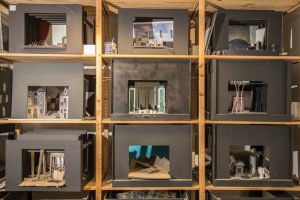 He is responsible for the whole process of turning a designer’s model into a working set. 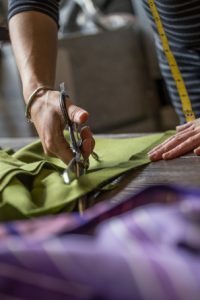 “The designer will come up with a model and it is our job to make it a reality,” he says in the Portakabin-style offices on the main hall floor. Behind him are the models from productions past, all with their own particular whiff of nostalgia. In many cases they are the production’s only physical remnant. 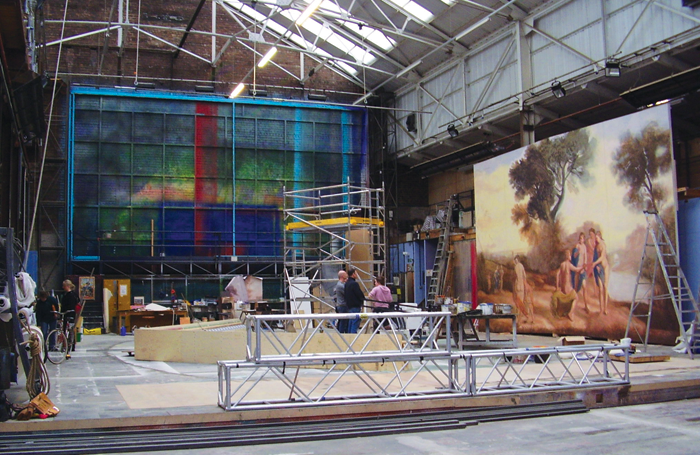 Dailly’s job is to take the model and bring it to the stage on budget and, most importantly, on time. It’s not like fitting a bathroom or building a house. The set cannot be late, it always has to make the deadline. No matter the competence of the designer, however, the practical aspect of realising the set still has to be tackled. Take the current Rhinoceros set, which looks very simple but is massively complicated underneath. Dailly is currently working out how to create a set piece with a lot of trucks and a ladder that looks good and can be used safely. Then there is the process of working out what materials to use. 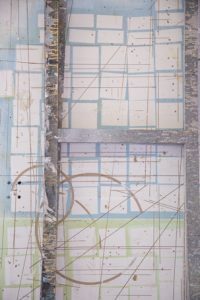 In this case, plastic will replace the usual plywood as it is lighter on the massive panels that have to be flown in – which is also causing problems for the paint department. 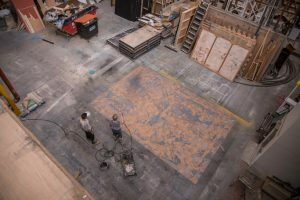 The panels have to be designed so they can be both broken down to fit in the truck to take them to the theatre and then, when they are on stage, they are not so heavy that they can’t fly into the wings. 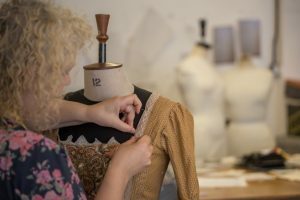 Although the workshops have been part of the Lyceum’s inventory since the 1980s, they are constantly evolving, according to both industry standards and the tastes of the theatre’s artistic director. 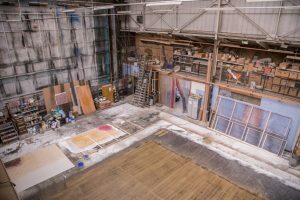 The current AD David Greig has bumped up the number of productions the company is doing every year, which has a knock-on effect in the workshop, in particular, and he is not always placing productions on the main stage, either. 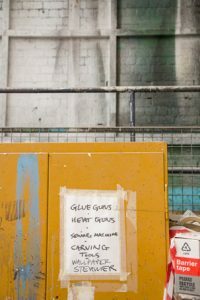 Health and safety regulations mean that completely different paints are used now: it is all water-based paint, with no more oil-based paint, no shellac. This is why the smell of the place has changed, too. 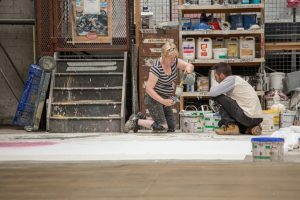 Head painter Fiona Clark started working at the theatre in 1989 on the stage door soon after graduating from Edinburgh College of Art. 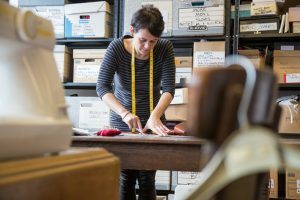 After a stint in wardrobe, she has been at Roseburn for 15 years. “It has changed a lot over the years,” she says. 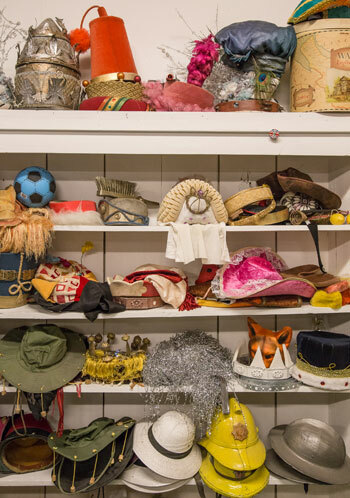 “The King’s Theatre used to store its pantos here, and it used to hire out a lot more stuff. The make-up of the team is quite different to how it used to be when I first started working here. “There used to be two drivers and a stores-person. The drivers had a small van, a bigger van and a truck for taking stuff to the theatre. They used to have a lot of work hiring stuff out to other people. Then they would prime stuff ready for the one painter they used to get in. It is not all progress, however. Gone, too, are the days when the painters would sit in with the designer on the tech and get their own notes. That can’t happen now because once the set is in, Clark is back at Roseburn, already on to the next set, working out the same logistics as Dailly of budget and timing. 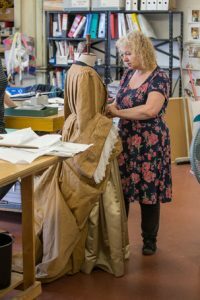 But by the next tech and first night, the designer should be happy, so Dailly, Clark and their teams will be in the Lyceum auditorium, keen members of the audience, just wanting to see the show. Their end is the play’s beginning.